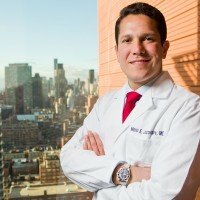 Memorial Sloan Kettering dermatologist Mario Lacouture says that certain cancer treatments increase the risk of skin cancer, especially in people treated for childhood cancers and in survivors with light skin that burns easily. Particular treatments affect the risk of skin cancer in different ways. Radiation therapy increases the risk of developing basal cell carcinoma, while stem cell transplantation increases the risk of squamous cell carcinoma. Survivors of pancreatic, testicular, and some inherited breast cancers have an increased risk of melanoma. Survivors can prevent skin cancer by wearing hats, sun-protective clothing, and garments that are made from dark-colored, tightly woven fabrics such as wool or polyester. Dr. Lacouture also recommends using a broad-spectrum sunscreen with an SPF of 15 or greater. Self-tanning products are safe for cancer survivors, but do not provide protection against ultraviolet radiation.